Product prices and availability are accurate as of 2019-04-14 17:52:04 EDT and are subject to change. Any price and availability information displayed on http://www.amazon.com/ at the time of purchase will apply to the purchase of this product. 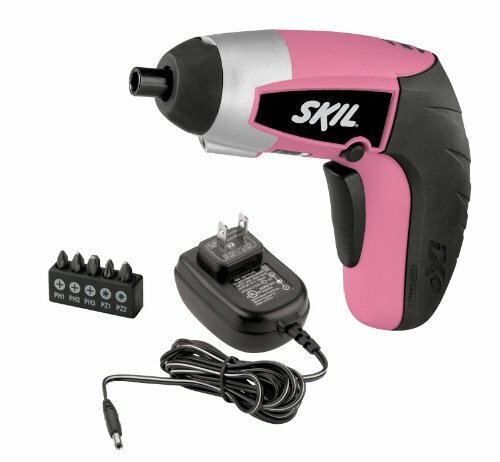 Ideal around the house, the SKIL 2354-06 is a powerful cordless screwdriver that fits neatly into the palm of your hand. The tool offers 4 volts of maximum power and high torque for greater efficiency. Convenient Controls and Indicator Lights Located above the trigger is a forward/reverse lever and trigger lock, which allows you to change the rotation of your bit or, when you're finished, to lock the trigger and prevent accidental starts or discharge. Forward and reserve LED indicators on top of the tool show your drilling direction. The tool's rubberized handle offers a secure, comfortable grip. Bright LED for Better Visibility For greater visibility when you're working, the SKIL 2354-06 iXO 4-volt palm-sized screwdriver has a built-in LED SiteLight that turns on automatically when you squeeze the trigger. The SiteLight is designed to be maintenance-free and last the life of the tool. The SKIL 2354-06 iXO 4-volt palm-sized screwdriver features a lithium-ion power battery that holds a charge for up to 18 months in addition to being compact and weighing only 11 ounces. Kit Includes: 4V Max Palm-Size Screwdriver, 5-Piece Bit Set and Charger.